Baltimore Total Joint Replacement Specialist: David Schroder, M.D. Dr. David Schroder joined TOA from a practice in Texas and specializes in joint replacement surgery and general orthopaedic surgery. He sees patients at the Bellona and O’Dea offices and operates at UMSJMC. His specific schedule will be forthcoming. A graduate of the US Naval Academy and Georgetown University School of Medicine, Dr. Schroder trained in orthopaedic surgery at Naval Medical Center San Diego. 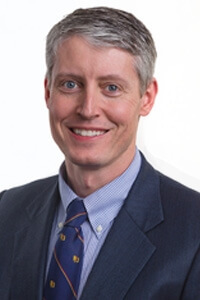 Dr. Schroder has had extensive experience in all areas of orthopaedics during his tenure at Naval Medical Center San Diego, Naval Hospital Yokosuka, Japan, and most recently as Assistant Department Head and Clinical Operations Officer of the Department of Orthopaedic Surgery at the National Military Medical Center in Washington, DC. Serving as Commander in the US Navy, Dr. Schroder provided surgical care to our wounded warriors both at home and in Afghanistan as well as executive care for our nation’s leaders of the Pentagon, Congress, and the White House. His special interests include total joint replacement, completing a fellowship in adult reconstructive surgery at Hospital for Special Surgery/ Cornell University School of Medicine in New York City. During his time at HSS, he gained comprehensive experience in replacement surgery, hip arthroscopy, complex revision joint surgery, joint resurfacing, partial knee replacement, and minimally invasive joint replacement. Dr. Schroder is Board Certified in Orthopedic Surgery, a Diplomate of the American Board of Orthopaedic Surgery, and a Fellow of the American Academy of Orthopaedic Surgery. Please tell us about YOUR experience with Dr. Schroder! Dr. Schroder: Thank you for being a positive and caring part of my life. You have been presented with many concerns and made my confidence in you grow with each one. -- Hazel G.
Dear Dr. Schroder: I just want to thank you for all you have done for me. You are a wonderful doctor and I am so grateful. God Bless You! -- Shirley C.